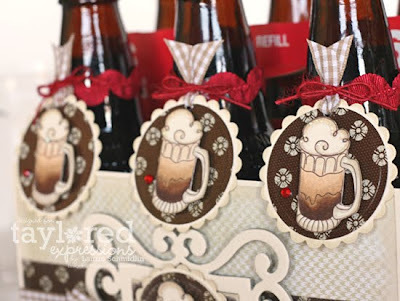 Stamp a Sweet Impression: Celebrating...with Root Beer Floats! Happy Tuesday!! It's Laurie here, and I've got a fun party/gift idea to share with you! Every year before school starts up again, we have a family "Back to School" party! It started as something to divert the kids from being upset about summer ending to having something to look forward to. It now has become a tradition for us and our whole family looks forward to it! Each family member is responsible for one part of the party (drinks, food, decorations, games, etc.) and we usually choose something that our family has enjoyed throughout the summer. One thing in particular that our kids have loved this summer is root beer floats! So, when it came time to choose what I would be bringing it was a no-brainer...root beer floats! Woohooo! Then, when I saw the overflowing mug from Taylor's new Chillax set I was beyond excited!! 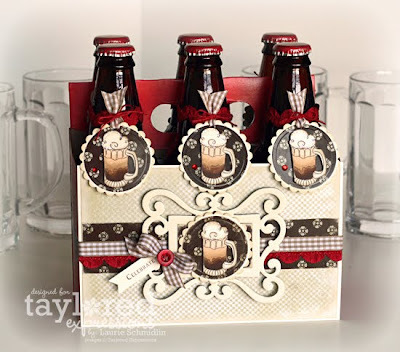 I got right to work altering this six pack root beer set! I measured the front of the root beer carrying case and cut some Choice Buttercream c.s. and patterned paper accordingly. I added a chipboard frame (that is painted with Ivory acrylic paint), some coordinating papers, ribbon, a button, and a tag (the Celebrate stamp is from the A Year of Sweet Sentiments set). I then created matching tags for all six bottles. I made the tag by stamping the mug image onto Choice Buttercream c.s. and coloring in with Copic markers. I used my Circle Nestabilities to cut out the circles and then added some ribbon and string on top. One last thing...they were just begging for some sparkle...so I added some Stickles to the top of the image and one red rhinestone for a little pop of color. Taylor is always adding fun new stuff to her store and subscribing to the Taylored Expressions Newsletter is a great way to stay up to date on all of those new additions! Just add your email address under the "mailing list" section on the home page of the Taylored Expressions store! Wow, this is absolutely fabulous! Love your choice of colours! OMW this is amazing! You are so talented and this is a PERFECT guy gift! SO cute! That is adorable. I love it and it is one of our family favorite treats too. You are so very talented. Thank you for sharing your work. It is truly inspirational! What a great idea and what a wonderful job. Love the colors. The is just AWESOME and so inspiring. I just love EVERYTHING about this project. You are one super duper creative crafter. Root beer never looked so good!! This is the BOMB Laurie! Holy Hannah! LOVE this! !